1. The Carolina Theatre's stage was decorated in the band's signature black and white checkerboard motif, and it still works for me. 2. The crowd was predominately dudes… I still wonder why I like bands that dudes like. Am I a dude? The checkerboard motif still works. 4. Nielsen is known for his fantastic collection of guitars, many of which he played during the show. One had the Beatles on it. One was shaped and painted to look like himself. One had 5 necks (see photo above). Sometimes he would switch guitars in mid song! 5. Robin Zander (who Nielsen describes as his "favorite lead singer in the whole wide world") sure has some pipes. Belting out with equal finesse show-stopping hard rock classics like I Want You to Want Me and plaintive power ballads like The Flame. He wails. 6. 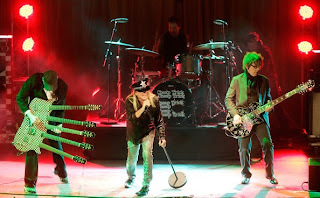 The other guy, Tom Petersson, was there too, playing his 12-string bass. He also wails and I like that he wears glasses on stage. He was and still is a good-lookin' fellow. 7. The drummer at this show was Daxx Nielsen, the son of Rick Nielsen. 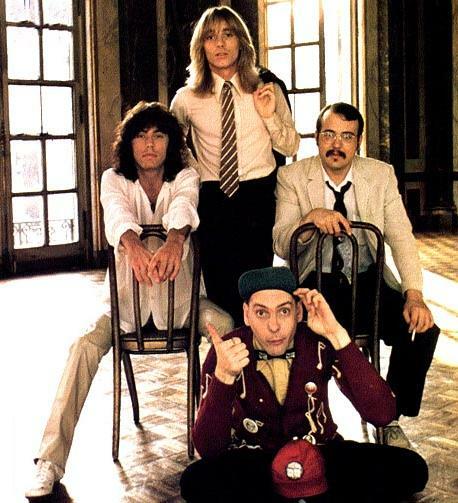 Bun E. Carlos was ill? Or…? There appears to be some question about why he doesn't tour with the band. 8. 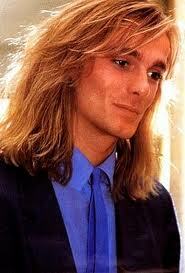 Speaking of fine-lookin' guys… I kept wishing Robin Zander would take off his hat. It was a police hat, I guess as in the "Dream Police that live inside of my head." Is that gorgeous golden mane of his thinning or gone…? Maybe he just likes hats. 10. I danced like crazy, and would like to apologize to my husband if he was embarrassed. I hope I don't dance like a middle-aged white mom, but I'm guessing I probably do. I shook my massive groove thing anyway. 11. Rick Nielsen keeps his guitar picks on his mike stand and throws them out one by one with startling frequency. Toward the end he was tossing them out by handfuls. My seat was not close to the front so I missed out on this bounty. I so wanted to get one for Bill, and and it crossed my mind that if I could just get him to see me, he would definitely throw me one. You can go ahead and laugh – I wasn't THAT cute even when I was young! 12. My husband, ever the critic, only attended the show as a favor to me… but he loosened up… and way before they sang Surrender he'd already given in to their unabating energy, sound and showmanship. And as for me – truly, if they want my love... they got it. *Since I'm not really a musician, this is MY description of how it sounds. I have no idea if this is right.